My friend Steve and I were headed to the Forever Grateful show in Danbury, Connecticut, on Saturday. We hadn’t seen each other in a while so we caught up at my place and hung out for a while. Then we stopped at a bar for a quick drink before heading to the festival at the west campus of Western Connecticut State University. Parking, of course, was a minor issue at the venue as we drove around the lot looking for a space. Eventually we turned around and headed back out of the venue to grab the nearest on-road parking spot, leaving a sizable walk for us to get to the show. The reason I got into so much detail is because the timing of this had to be just perfect. If we hadn’t stopped at the bar, or if we had found parking immediately, we would have missed it. 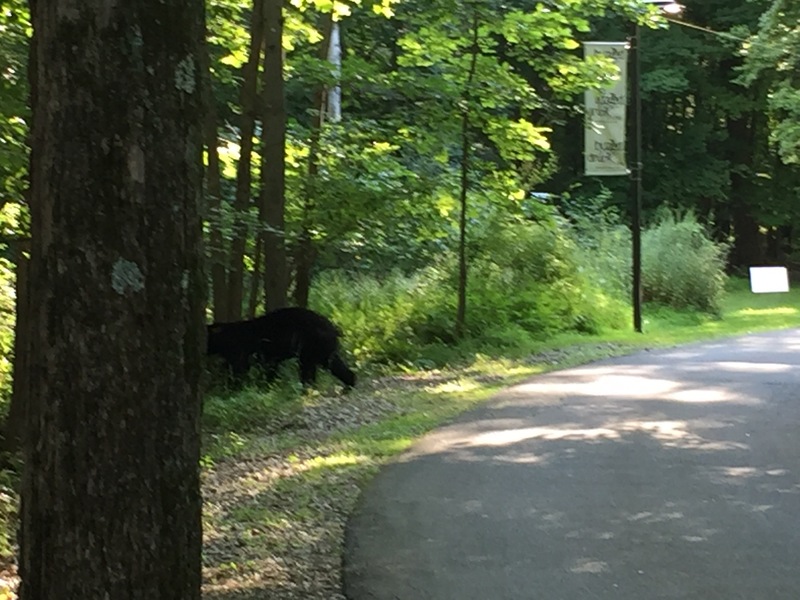 As we headed to the security area, and there were, I’m guessing, about a dozen people there, a black bear crossed the road and went into the woods — heading toward the festival. It veered course and headed in the direction of the foot path that led to the entrance. The foot path allowed for a little clearance of the woods and I got my iPhone ready to get a photo of this awesome creature as it got into the clearance and crossed the path. 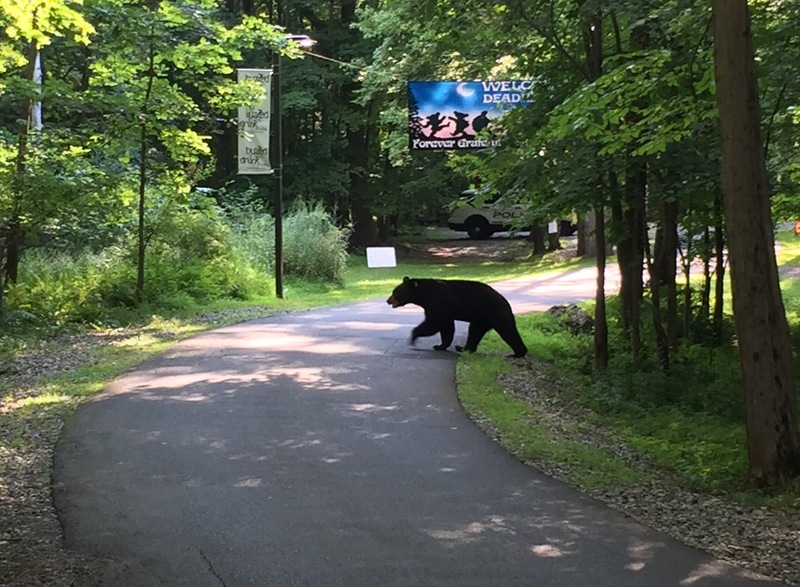 It took a matter of seconds for the bear to emerge from the woods, cross the path and disappear into the woods on the other side — away from the music venue. I did get my iPhone photos, though. It’s funny, I think anyway, that the real bear crossed in front of a banner showing the iconic Dancing Bear logo of the Grateful Dead. Reactions were mixed among the dozen people who were there. Some got very nervous, some got very excited, and some seemed fairly unmoved by the whole experience. I, of course, was excited. The bear itself just kept moving and never batted an eye when it entered the area where the people and cars were.